When the winter solstice occurs, the setting sun shines upon a podium of the Monastery at Petra. This produces the silhouette of a lion's head that shines on the rocks opposite to the structure. Add the Monastery at Petra to the monuments that humans probably built for astronomical purposes. New research suggests that ancient architects tracked the motion of the sun and constructed the religious center with the winter solstice in mind. When the Earth reaches its farthest point from the sun, light from the sun shines into the monastery — which is located in Petra, Jordan — and falls upon the podium of a deity. 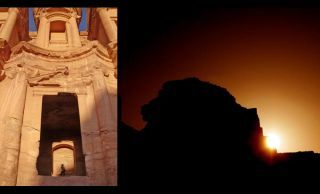 At the same time, the light casts the shadow of the head of a lion (a sacred animal in Nabatean culture) upon a mountain opposite to the religious center. The structure in ancient Arabia is just one of several Nabatean temples, palaces and tombs on which scientists conducted a statistical analysis. The Nabateans flourished in what is now Jordan, and surrounding countries, between the 1st century B.C. and 1st century A.D.
"The astronomical orientations were often part of an elaborate plan and, possibly, a mark of the astral nature of their religion, which showed incredible 'hierophanies,' or demonstrations of the sacred on monuments related to cultic times and worship," he said. Another significant structure, the Urn Tomb, has a main gate centered with the equinox sunset, while solar rays from the summer and winter solstices shine on the building's interior corners. In 446 A.D., when the structure was converted into a church, scientists said the locals used the solstice markers to honor Christmas Eve (Dec. 24) and the birth of St. John the Baptist (June 24), which fell around the winter and summer solstices, respectively. "This amazing set of three alignments within the plan of the tomb, in combination with significant features in the distant horizon, can hardly be ascribed to chance," added Belmonte. "We consider that it is a deliberate attempt to convert the hall of the Urn Tomb into a type of time-keeping device." The results were published in Nexus Network Journal and include participation from the Canaries Astrophysical Institute, the Spanish National Research Council and the University of Perugia in Italy.